Where do I use my Shoe Zone voucher code? Choose from the current offers available for Shoe Zone here at NetVoucherCodes. Click ‘Apply’ and continue with the payment process. Head to the Offers section for some fantastic savings, including; multibuy offers, clearance offers and last chance to buy. Having opened the first Shoe Zone store in 1996 their history goes back to the 1980s, and they now have over 570 stores within the UK and the Republic of Ireland. Their online shopping site was launched in 2010 and continues to provide value footwear. The ranges cover everything from slippers, shoes, boots and wellies for men, women and children. With a wide choice of styles and sizes, there’s no excuse for not being able to find a suitable pair that is comfortable, stylish and on-trend with the latest fashion styles. Together with a bags section, you’ll find everything you need to complete your outfit. 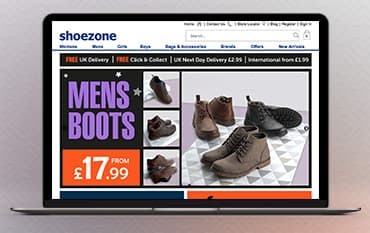 Shoe Zone offer FREE Standard Delivery as well as an option to pick-up in-store; they also have a free, 90 day returns policy if you encounter any problems. If I order for collection to store, how will I know when to pick up? You will receive an email to let you know when your order is in the store and ready to be collected. How will I know which size to order is they are European sizes shown? A guide to help you convert from Uk size to European size can be found towards the bottom the FAQ page. How can I contact Shoe Zone? Shoe Zone is a large Footwear retailer offering stylish shoes at affordable prices for all the family. Their range of shoes, sandals, boots, wellies, trainers and slippers include well-known brands such as Earth Spirit, Lilley, Softlites, Truffle, Zone, Zone Hearts, Earthworks, Ascot, Ashwood, Blackrock, Beckett, Mercury and more. Add a Shoe Zone voucher code and save money on your next pair of shoes. They also sell character shoes and accessories for children, including Despicable Me, Disney, Peppa Pig, Hello Kitty, Spiderman, Batman; Star Wars, Thomas and Teenage Mutant Ninja Turtles.